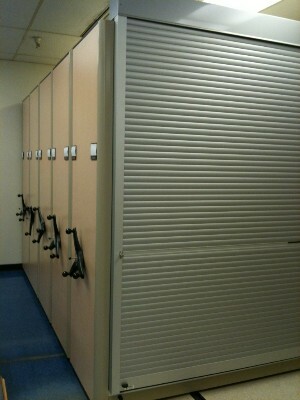 Secure High Density Mobile Shelving Systems lock down your files in the highest density storage system possible. With a waist high floor lock, ground level floor lock, or with electronics in an electric mobile storage system, a high density mobile shelving system can be locked down entirely securing your files in bulk. High Density Mobile Shelving Systems can be segmented into separate individual system within one central system if required to securely store multiple departments. This is accomplished with single sided locking carriages and typically a carriage with back to back shelving and solid steel backs that close off a section. 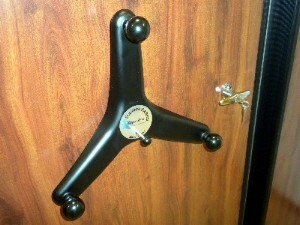 Another way to secure sections is with individual locking doors or roll down locking doors. 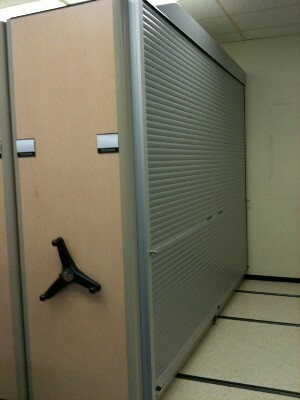 The roll down locking doors can be configured with a remote control and pin code access for high security requirements. 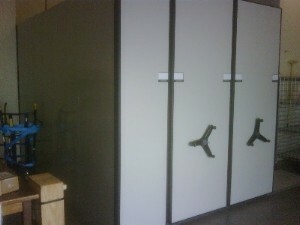 One example of a secure high density mobile shelving system is featured at our customer Hollywood Vaults. 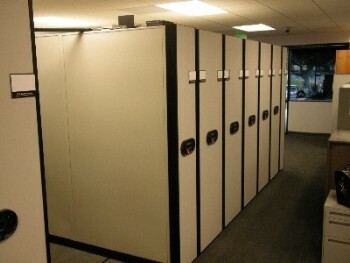 Hollywood Vaults is the premiere media storage facility in Los Angeles with the highest levels of security possible. 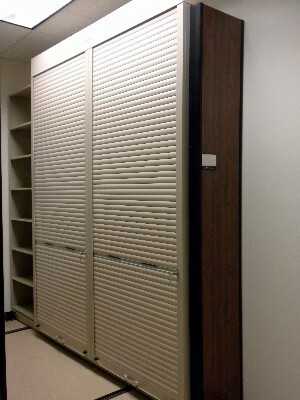 Or Secure just an individiual section with security doors to add an extra layer of security to your file room requirements.